Thanks to kurobara for translating the original comments! Under the name of “The Works for Soundtrack”, this is a new step (*on my career) based in the release of a 3 CD set. I’ve received so many messages asking if this would be a Greatest Hits album, but the truth is that it is quite different from that. To say it clearly, this is a selection of “Yuki Kajiura’s soundtracks that haven’t been released until now” + “Soundtracks that wouldn’t work well as a standalone”. Then, as a product, it is generally previous to Noir, but quite a lot of time has passed, so the work I’ve been doing lately for the NHK is also included. To be honest, I partly feel a bit embarrassed when I hear my past songs. However, no matter which work is it, it showed me the joy and fun of making “Soundtrack” music that snuggles up to the cinematic image more than anything, and one work after another, it made me learn so many kinds of things of which I’d never get tired of talking about. It is also a collection that includes a part of “What Kajiura has achieved so far”. 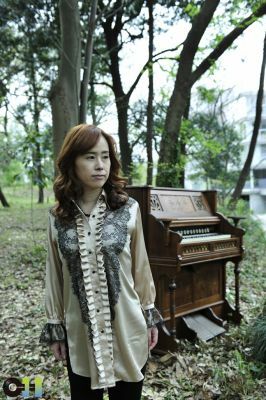 Many songs are the very first instrumental tracks that Kajiura, who until then only had interest and will to work with songs that emphasized the singing rather than the instrumentation, wrote. Those days, I had such an impression on the instrumental (*it is not explicit, but she invites us to deduce what was her impression on it). Those were days when I wasn’t intending to work on soundtracks, and I hadn’t even done any predictions of my own future. Now, when I’ve been making the selection of songs from my early works, I realized I’ve been taught so many things by so many people, and they made me encounter with my works. I am full of thankfulness for each one of them. Well well, I am someone who still has a lot to learn, so in order to reward my debt (*to them), I feel I have to be very diligent (*with her work and learning). Even so this is not all about my early works, since the stuff listed on the two last CDs is relatively recent, yet it is stuff you didn’t have the chance to hear in a CD until now, such as the theme song for Keizai Rashimban (Business Compass), 15 Sai no Shiganhei, a drama which was aired during 2010’s summer, Sekai Satoyama Kikou, which I had the pleasure to be commissioned several years ago, and mainly things like these. For those who love my work, and now have the chance to hear it, I am very happy. The total volume is 75 songs, but being movie or drama music, tracks are generally short, so I have the feeling that it’s a relatively light and calm collection to hear to entirely (*I mean, straight from beginning to end). It will be a privilege for you to hear this album “The Works for Soundtrack”.